Maurilio Amorim » Divine Encounters: Will You Engage? Divine Encounters: Will You Engage? You can’t predict it. You can’t prepare for it. But when it happens you can choose to embrace it or reject it. “The encounter” is what I call it: a time when someone, a total stranger walks into your life and your worlds collide. For whatever reason you find thrust into the middle of another’s life story and the choice is clear: I either engage or choose to walk away. If you know me, you already know the answer to that dilemma. I engage. Just this past weekend I was reminded of a particular memorable “encounter.” Greg and Joanie Anderson showed up at an event I was hosting in Palm Springs in partnership with a publisher. The interesting thing about them is that I didn’t know who they were and had not invited them. But they made it into the publisher’s list somehow and showed up at our event on the other side of the country. “Who gave you my name?” “Why am I here?’ Greg asked me repeatedly. I really didn’t know. For all purposes they were not supposed to be there. Well I didn’t know why there were there then. But I know now. During the next six months, I helped Greg make one of the most significant transitions of his life. 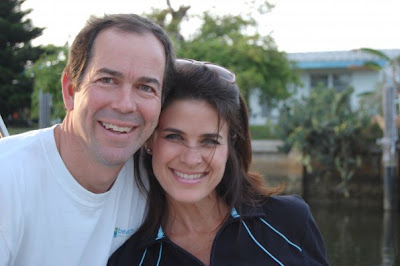 Greg and Joni moved from Myrtle Beach where he had lived his entire life and served on staff of Myrtle Beach Community Church to Ft. Lauderdale where he’s now on staff of Calvary Chapel Ft. Lauderdale one of the country’s largest churches. Greg didn’t need another friend. If you meet him you’d know why. He’s one of the most likeable and genuinely kind men you’ll ever meet. But for whatever reason, God chose me to walk with Greg during those days. I’m glad I engaged. I was reminded of why as we visited for a few hours this past weekend and watching Greg and his family flourish in life and ministry. What rich friendship do you have that started as a divine “encounter”? Thanks for sharing Maurilio. That's a reminder that sometimes I'm too busy to engage. My best friend, Jeff, is someone God put in my life during such a time as Greg's. I'm ready to re-engage. Glad to hear Karl. The blessings always outweighs the inconvenience. I sat next to a woman in an airplane and we become good friends since then. She was going through a divorce and I was able to share my faith and perspective on beginning again with her. It's been 3 years since then and I we still keep in touch. That is really cool. It reminds me why it is sooo important to have a personality like Christ (magnetic). My last Divine Encounter was a few years ago when I met my (now) wife.